Earnings per share or EPS is a fundamental measure of the health and profitability of any corporation. The EPS figure answers this important question: for each stock share of the business, what was the reported profit? The basic earnings per share calculation is quite simple. It's the total net income available to common shareholders, divided by the total number of common shares outstanding. Net income as it's used here and in almost all financial calculations is defined as the sum of all revenues less all costs, including operational and management expenses, depreciation, interest, taxes, and dividends paid on preferred shares. Unless specified otherwise, it's assumed that all relevant data, including EPS, are for the company's fiscal year -- which may or may not start on January 1. It's also customary to subtract from net income all non-cumulative preferred stock dividends declared (whether or not paid during the fiscal period) and the after-tax total of preferred stock dividends. 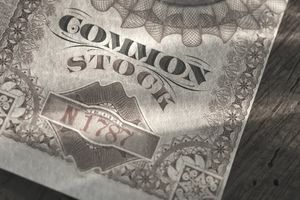 The number of common shares outstanding figure is more accurately based on a weighted average of the common shares outstanding since the total shares figure changes over the course of the year for most publicly traded corporations. For the EPS figure to be useful, however, you need not do any of these more refined calculations. Since they apply to all corporations equally, the EPS figure given online or in financial news reports for any corporation allows you to compare this corporation's results with the results of others without getting into the details of the math. The EPS figure is meaningless until you relate EPS to share price. When you divide share price by earnings per share, what you get is the price/earnings ratio (P/E), one of the most widely used and revered of all financial tools. It's that essential "bang for the buck" figure that tells you what you're getting for your investment dollar. Both EPS and P/E are best used comparatively to answer such questions as how well is this company doing in comparison with other companies of similar size competing in the same financial sector? ; what are the patterns for EPS and P/E over successive quarters? By itself, an EPS of $4.00 doesn't mean much. But if you learn that the $4.00 EPS figure has grown in successive quarters from a $3.35 EPS a year ago, that tells you quite a bit. If it's declining over successive quarters, that also reveals useful information about the company and suggests that it may not be a promising investment. The one EPS figure that gets the most attention is the EPS announcement in the company's latest earnings report when compared with the company's earlier preliminary announcement of projected earnings. There's a little bit of game-playing going on here -- companies sometimes deliberately make a public announcement of projected earnings that's less than the company's internal analysis because this leads the financial press to exclaim that the company's earnings "beat estimates. It often boosts the share price, at least temporarily. But you can't make too much of a modest increase in the announced EPS over the earlier estimate; it's a bit of a ploy. However, an actual EPS that's below the projected estimate may indicate a company that's headed for trouble. And a company that delays its EPS announcement is usually a company already in trouble.